In this video I show you how to make a low sugar smoothie bowl for energy, focus and immunity. 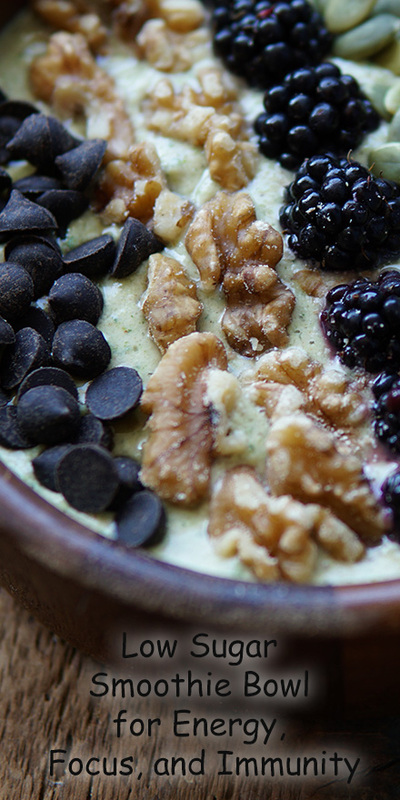 Often times smoothie bowls can be loaded with sugar because their base is made with high sugar fruit like bananas. Add to that the base is usually raw and it can be kind of hard on your digestion. This smoothie bowl uses gently cooked and then frozen zucchini for the same smooth and creamy quality as banana without the high sugar content. Because the zucchini is steamed it is much easier on your digestive system. Zucchini is known to reduce your blood pressure because of its potassium and also the magnesium in it keeps you calm and steady. 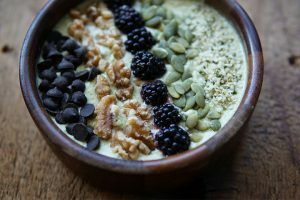 The base also contains a nut butter and protein powder (21 g of protein) which will increase the protein content and slow down the absorption of your smoothie bowl into your blood stream as well. Let’s talk about the 8 kinds of mushrooms in Orcankia Health Vege Pro and how they help your energy, focus and immunity. Cordyceps Mushrooms – This is one of my personal favourite musthrooms, it is an adaptogen. Cordyceps activate your body´s own energy production in the cells. Agaricus Mushroom – Is known as God´s Mushroom and boost your immune system. Shitake Mushroom – Boosts energy and life force, heals your skin, supports your liver and enlivens blood. The toppings for our smoothie bowl today include pumpkin seeds. One of the coolest things about pumpkin seeds is that their nutritional benefits actually improve with age. Unlike other foods that decrease in nutrient density and decompose as they age, studies at the Massachusetts Experiment Station showed that squash and pumpkin seeds stored for more than 5 months actually showed a marked increase in protein content! Out of all seeds, they are the most alkaline-forming in the body, which is good news because our bodies tend to be more acidic on the standard-american-diet (SAD) and so we are always trying to create more alkalinity in our bodies since acidity is linked to excess weight, pain and other health problems. Hemp seeds are a wonderful source of protein and fiber, they are also a great source of essential fatty acids, in other words they are a good oil. Walnuts : Help you sleep. If you want a good night’s sleep, eat some walnuts. Walnuts have bio-available melatonin, which is ahormone that helps to induce and regulate sleep. They also boost your mood if you experience stress and anxiety because of their omega-3 fatty acids. Studies have shown that people with diets low in EFAs experience more depression and stress. Blackberries : Can improve brain help and improve memory loss caused by aging. The antioxidants in berry fruits help fight free radicals and alter how brain neurons communicate. This may help to reduce brain inflammation which can lead to cognitive and motor issues common with aging. If you live in Victoria B.C. or Sydney B.C. you can get all of these ingredients at Mother Natures Market.